Well, so it begins. Another year begins at The Excelsior Press Museum Print Shop. But this year won't be like last year - not so much is likely to happen in the print shop this year. Due to extenuating circumstances and family commitments and obligations, I have had to make a decision between my family's needs and those of the Letterpress Community. As you might have guessed, the family won out. Accordingly, I am cutting back my "shop hours" to a great extent. And, although I will likely be "in" for a few hours each day - to complete current projects, keep existing promises and ship parts and supplies for which orders have already been placed, I will be avoiding - as much as possible - any new projects. I may not be able to respond promptly to emails and messages, so please accept my apology in advance of your query. I already have 6 presses in the process of restoration and a number of orders of type cases and cabinets to ship and many ink rollers to cast, but beyond that - and hopefully restocking some of the "Things we make here", please don't expect me to be able to respond - even to simple inquiries - as quickly as I would like. This may change as time goes on, so be assured. I am "OK" - just overwhelmed with a variety of things which need my attention at this time. 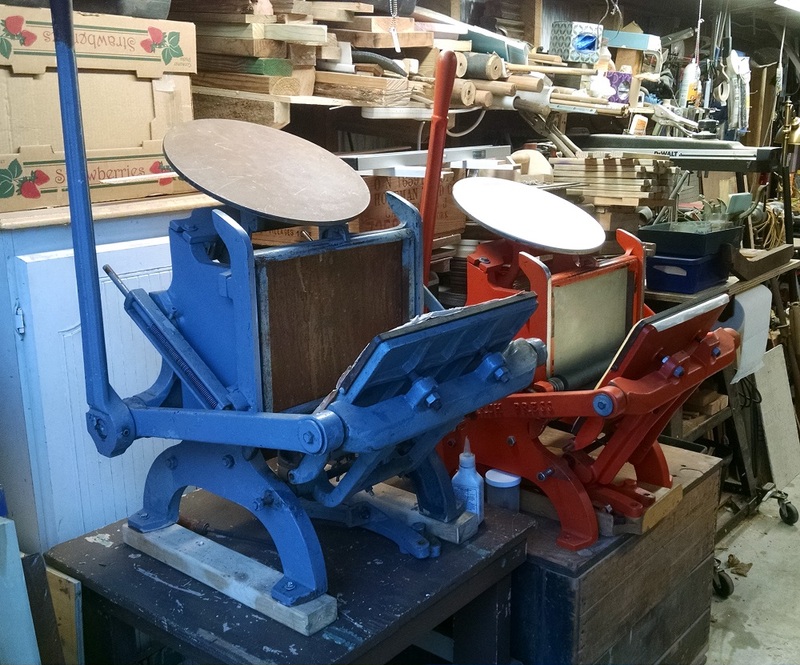 As my time frees up, I will be back in the shop, printing, making parts, restoring presses and filling orders for supplies. - and I will happily post announcements here. So. The dust is beginning to settle on some of the larger issues that faced me last month, but there is still a lot of catch-up to do, so we're still unable to respond promptly to inquiries. But we are beginning to catch up. Our friend Bob Bozzay set up the print shop at New Jersey Olde Town Village in Piscataway, NJ last year using his father's unique old press - an actual and very rare Baltimore Jobber #4 from the 1800s - which he brought out of the basement and set up in one of the old buildings at New Jersey Old Towne Village. We are honored to have cast the ink rollers used on his old Baltimore Jobber. 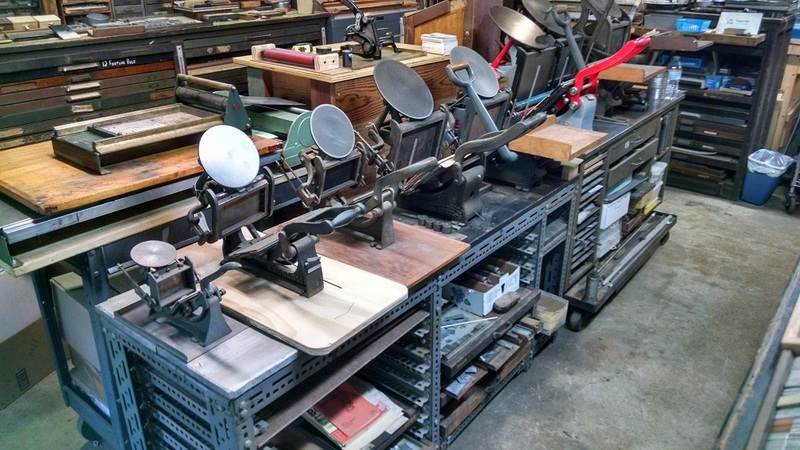 These were custom-cast to fit his press using 20-durometer polyurethane rubber - with a shelf life of more than ten years and a softness and tack as only found on the old composition rollers that printers always preferred for hand-fed platen presses, but which are no longer available. Since Bob is a printer AND a blacksmith (and a retired engineer, etc...), in this short news video, Bob is shown at the forge while his print shop apprentice, Rachel Lee, represents the printer at New Jersey Old Towne. 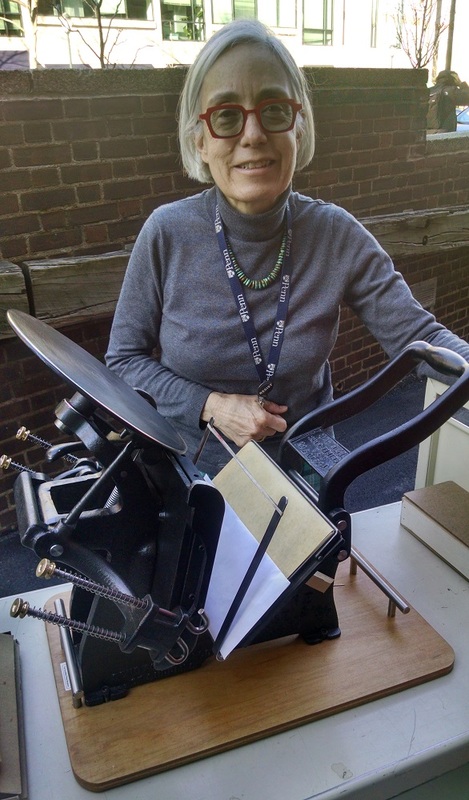 Well, not only has the dust settled, and the snow stopped, but we are getting back to work - currently finishing up the long-delayed restoration of a small press for UPenn to use in their traveling exhibit about Walt Whitman. There is still a lot to do, but this press had been expected in December. Events overtook us and we had been unable to work in the shop since December. But now we are back - and loving it. This restoration, btw, has some new features added to it. Two of them - the radiused chase corners and the oil slot for the ink disk were taken from our experience with Chandler & Price presses over the years. We also filed out the mounting slots on the base of the press. 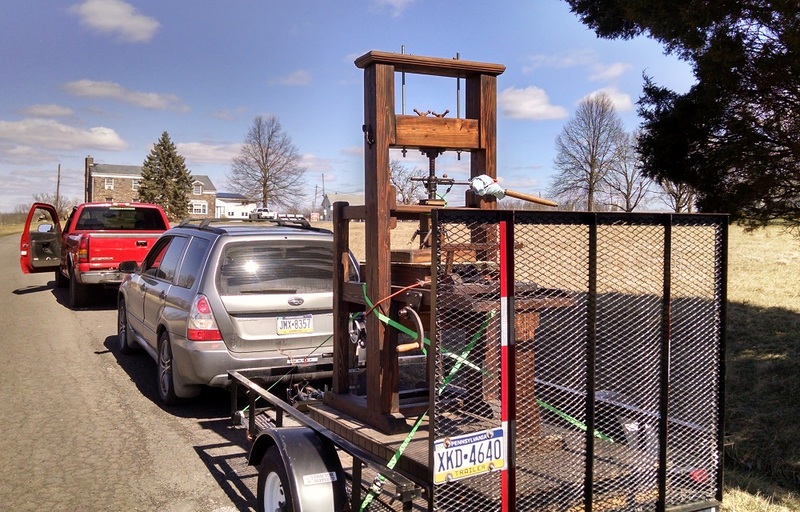 Now the press willl mount more firmly and reliable. In fact, this press boasts a number of new features in our restoration work. One of them is a new paint - a denser, strong, thin-coat paint that will prevent chipping of the paint as we experienced with the old primer-plus-paint procedure used in the past. But admittedly not fast work, as many have learned, but quality work lasts and we believe that in the long run, that's more important. When we restore a press, it's intended to be used for 100 years or more. That's one reason we use Stainless Steel drill rod for all of our shafts. 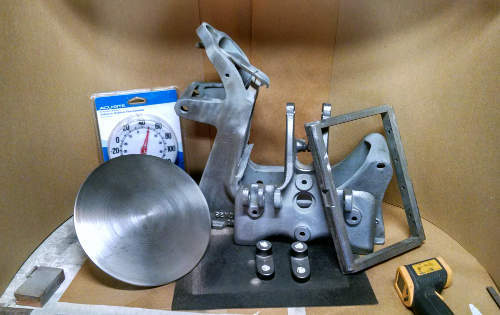 The stainless will look better and delay rust better than common steel, and is not as tough as the cast iron that the shafts run in. This way, the shafts will wear before the casting is damaged. And, with the clips in place, they will never fall out - as has happened many times in the past. It's worth a little extra expense in materials. Since Kelsey presses have no bushings or bearing, and all rods must rotate within a cast-iron hole, this is a factor worth addressing. Shafts are easy to replace; castings not so much... And, on the shafts, we are cutting fine grooves into the ends that will hold E-clips or Spring clips to hold the shafts in place. In the early days, Kelsey simply cut common steel rod and hammered it in, mushrooming the ends to hold it in place. Later models used a push-cap to sort of hold them in place. But they often came off. Our restorations use machined stainless steel shafts with grooves on the ends and spring clips that will never come off. Oh, and we also did some additional grinding - sanding, actually, on our belt sander - to clean up some rough spots on the nearly 100-year-old casting. It makes it look better. We have also set up a heat-able paint booth. Cold temps do not encourage good painting, but we installed an electric heat pad in the paint booth that lets us maintain a nice 60-70 degrees inside the cabinet to enable quality painting. We even got one of those spiffy new laser thermometers to let us check the temperature of not just the space, but the individual parts prior to painting. Spring is almost here! Last night, the temperature dropped to 9 degrees.... for the last time this winter! The prediction is for no more temperatures in the teens - or even the 20's more than a few times between now and next winter. It got up to nearly 40 degrees today and 50 is promised for Sunday. From then on, it could hit 50 or more every day until next winter. Now, that's not to say there couldn't be a surprise in store... it has happened before - like this 7" snowfall we had on March 2, 2009 - see: http://baptistown-nj.com/snowscene.2009.0302.jpg and more of the same in 2015 - and last year, we had 4 nor'easters in 3 weeks - set a record. 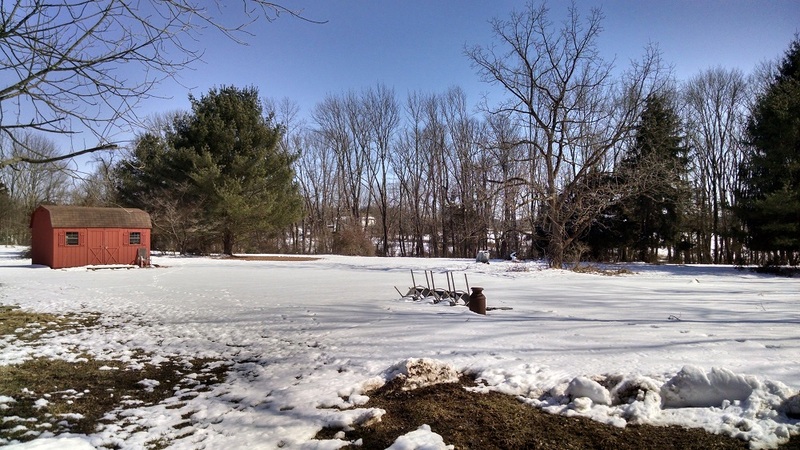 In fact, we had two feet of snow fall during last March and another 5" snowfall on April 2, so this 6" snowfall is not so serious, but (with fingers crossed) it looks like it is the end for this year. So, frosts, even snow falling on the early blooming flowers are still possible, but we're keeping our fingers crossed that soon combating the cold weather will not be taking as much time from my day as it has for the past few months. In 1968, I had enlisted in the USAF - with plans and promises to serve as a Language Technician in Europe... Well, as often occurs in war time, I was "needed elsewhere" and soon found myself on the Cambodian border with Vietnam, loading and unloading USAF C-130 cargo planes in some very interesting - and often dangerous - jungle air strips. Nice and warm today. Can you believe it - 70 degrees! 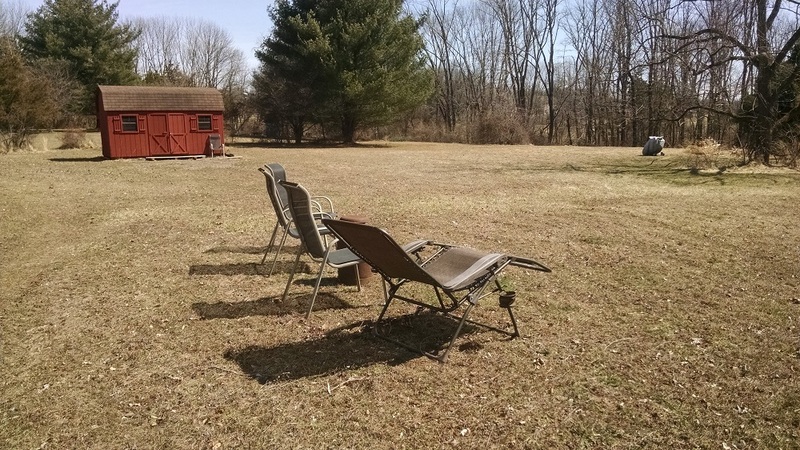 Now all the snow is gone and the land is waking up and stretching as the ground warms up (to 45 degrees today) and little green things are beginning to grow... Yes. Spring is coming! And, we Got the rollers cast... for The UPenn Press Restoration well, almost. The rubber mixture is in the tubes and beginning to cure. By tomorrow night, they will have cured enough for removal from the tubes. Another day or two of curing and they'll be ready for ink... We're finally coming down to the wire with this long-overdue restoration. But it will be beautiful and will work better than it ever did before - and this press will be printing for another 80 years or more! Well, if you find printing presses interesting, take a look at The Martin Howard Collection of typewriters! 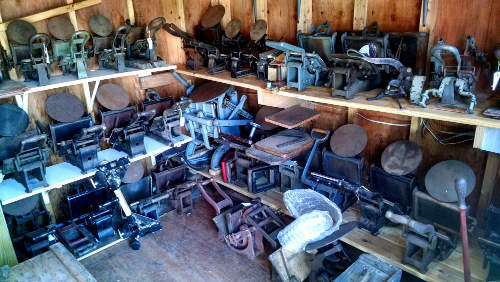 - Some are as old as our presses! Well, a lot has happened since our last post. Saturday evening, we removed the cast rollers from their molds. Success. We have some nice, soft, tacky, 20-durometer rollers to use on the UPenn press. 3/21 - Thursday - Stained and Varnished UPenn's press' base today - and mounted the handles. 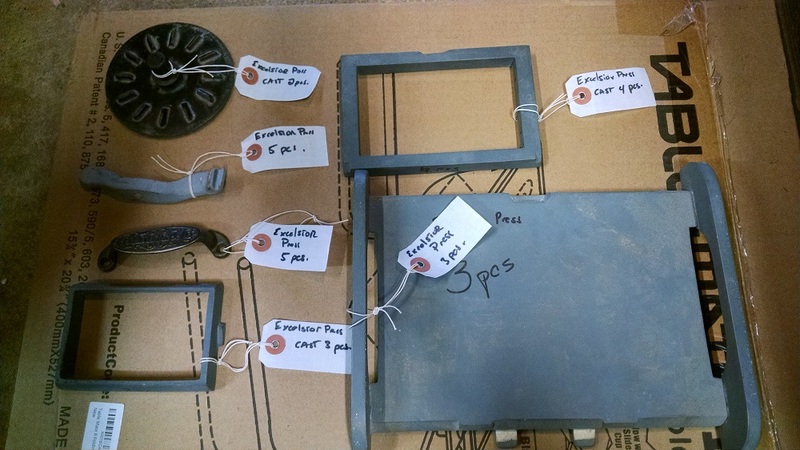 Tomorrow, we reassemble the entire press and .... we will be able to print soon! 3/25 - Monday - The U-Penn Restoration is Completed! Tomorrow, we will deliver the press - in person. Ship rollers to Iowa - in a nice, new, sturdy box. 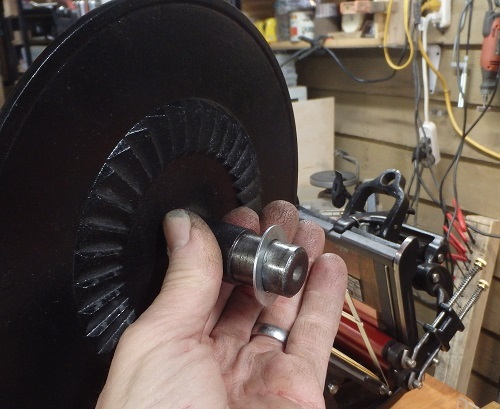 Set up molds and plugs and cut shafts to cast Kelsey brayer replacement rollers - ship one to the fellow who prompted this project - and keep casting them until the six brayer frames I have here have good rollers in them. 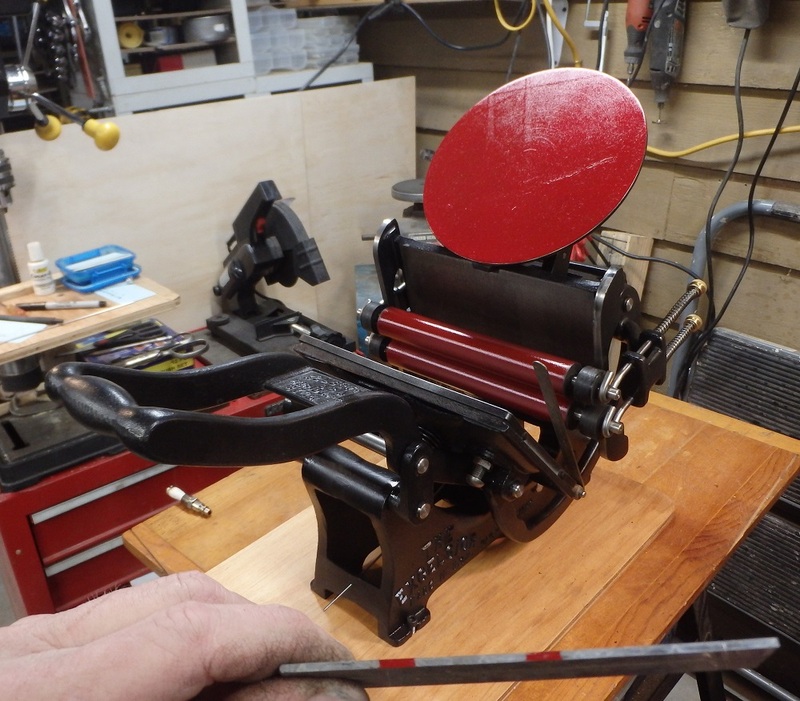 Set up to cast 2" brayer rollers - and ship one to the fellow who sent me his old one to recover. 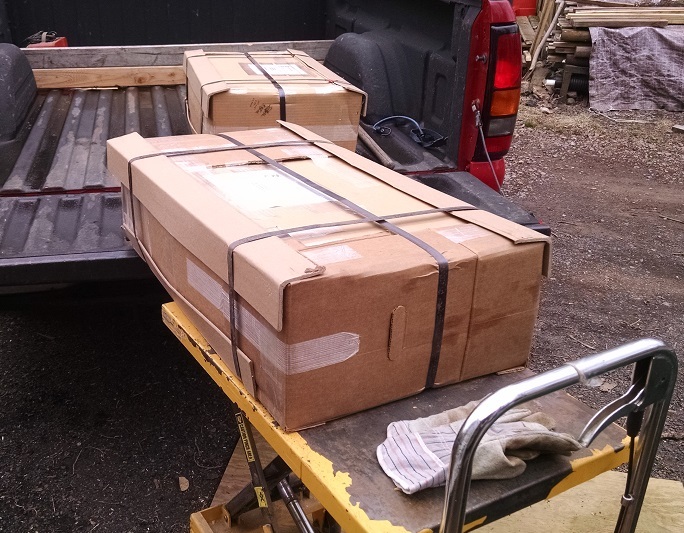 I really shouldn't have driven 100 miles on it - on interstates when I delivered that press to Philadelphia, but I had to get that press delivered so that I could get the money to buy the tire I needed and pay the postage to ship those type cases! I updated the web site - and posted that video. And I wrote about it on the UPenn page - under the subheading: Add a Shim to your Ink Disk Adding a shim beneath the ink disk is a solution to the common problem of rollers hanging up on the disk as they come off of the disk and reach the chase bed rails - which are relatively higher when the disk is too low. Raising the disk just a bit can smooth out the action of many Kelsey Excelsior presses that exhibit this trait. We make shims to solve this problem - and others. Shims can also help with a disk rotation problem no the large Craftsmen Monarch 9x12 press. 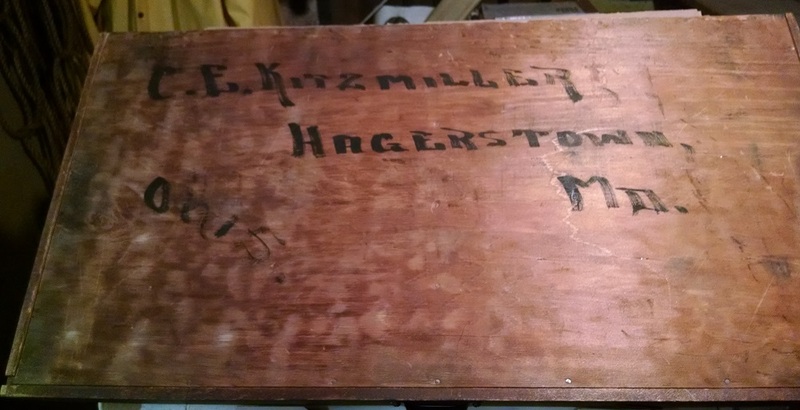 In the old days, when type cases were shipped, the address was simply written on the back of one of the cases, they were all tied together with rope and then placed on a train or in a horse-drawn wagon and taken to the buyer - as seen in the photo to the right. Had a busy day today with visits by our friend Claudia and her friend as well as two of her students - who helped me bring the old 9x12 Craftsmen Monarch from the press shed into the shop so that I could study it as I figured out what was wrong with her aluminum Monarch. The ink disks don't rotate as they should - on either press. I think it's a Craftsmen design flaw. Got an email today from a professor at a college in Texas. Looks like I'll be fabricating some type cases like this one soon... It will be going into a colonial printing office in Texas. Had a bit of concern while wandering my land Sunday afternoon. 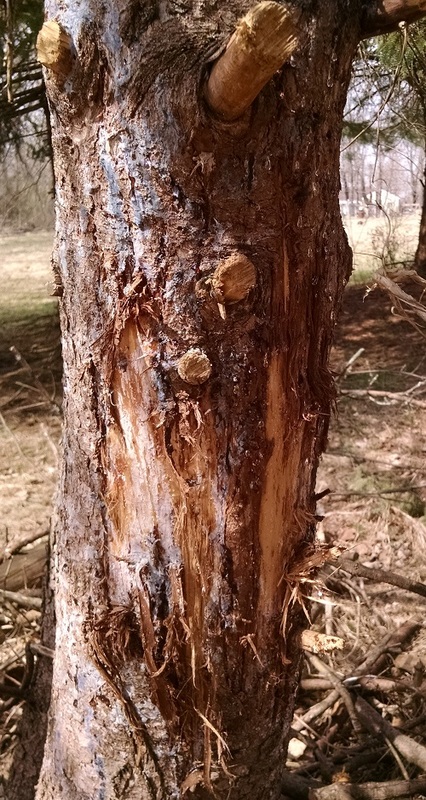 On one of the trees in the back, I found what appears to be bear scratches. The paw that made these scratches had claws as far apart as the width of my finger. Wow. I just stumbled upon John Falstrom's Amazing page at Perrenial Designs. This guy is THE Pearl Guy, for sure. He also lays out a very plausible argument regarding the advantages of the No.11 Improved Pearl over the most popular table top in use today - the venerable C&P Pilot. And, I agree wholeheartedly with his assertions and conclusions. Good reference on the Pearls of William Golding. At the bottom of the page, there is an 11-image slideshow illustrating changes made to the Old Style Pearl between 1877 and 1895. For an old press enthusiast like my self, I found it fascinating - and similar in many ways to the subtle changes I have discovered myself in the various Kelsey Excelsior models over the years. "In search of the 30 point Brush" - A printer in Vancouver, B.C. uses 30 point Brush foundry type for foil stamping of padded folders. They need more type and inquired whether we had any for sale. Well, since our vast collection of type has not been fully cataloged yet, I couldn't be sure, but I did promise to scour the barn for fonts of 30 point Brush. 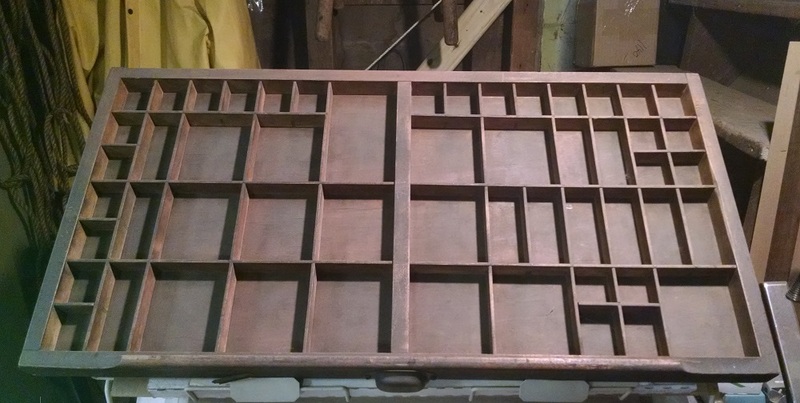 Preparing an old ATF Type Case Rack for shipping to Ohio. 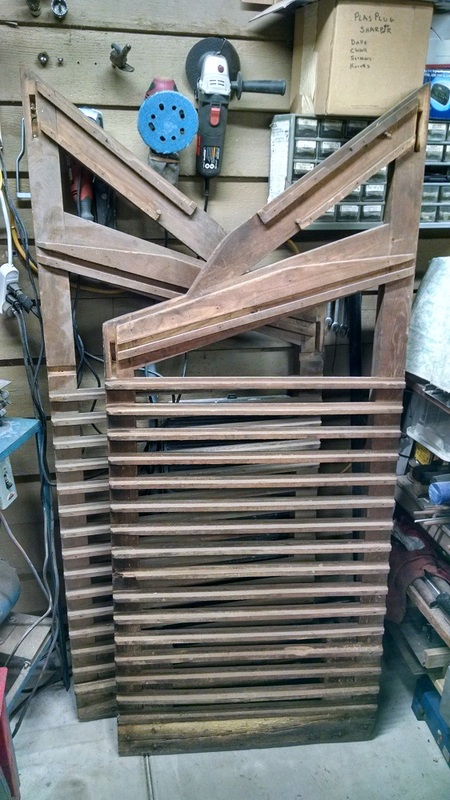 I brought that type case rack - aka "City Stand" over from the barn today and managed, somehow to fit it into the already over-crowded work shop - with two rather large presses already taking up more space than could be spared. 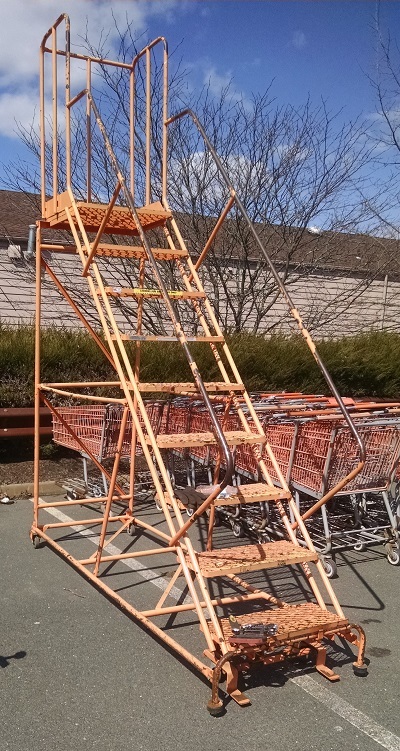 The original plan was to simply wipe it down and clean it up a bit - and make any repairs needed. Well, it does appear to need some repairs - a few new case rails and a new set of risers on the bottom; perhaps some new cross pieces.